Deadly West Virginia Floods - MetStat, Inc. 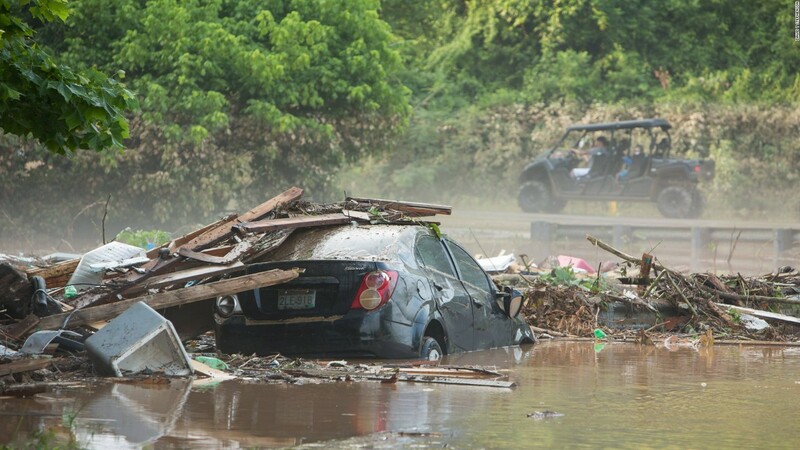 The last weekend in June, a series of large thunderstorms produced historically heavy rainfall across much of West Virginia, ultimately resulting in the loss of 23 lives. The mountainous, complex landscape of West Virginia makes flooding an especially dangerous scenario, because rain water rushes down narrow and steep valleys, within a matter of moments generating a swell of water that can wash away vehicles and homes before people have time to react. The heaviest rains over this weekend mainly effected the counties that contained this type of rugged terrain. Lewisburg, located in Greenbrier County, was one of the towns effected by the heaviest of rainfall. With an average of 3.74″ of rain over the entire month of June, the roughly 9? of rain that the town experienced over a matter of days adds perspective to just how extreme that amount really is. And with an average of 40? of rainfall falling annually, the storms that passed over the county from June 21st-24th produced nearly one quarter of the rainfall Lewisburg would expect in a given year. Below is NEXRAD radar imagery from the evening of June 20th to the morning of the 24th (84 hours total). Notice that across this more than three-day time span, parts of West Virginia were almost constantly under of some sort of storm rainfall. Also note that the afternoon and evening of the 23rd correspond to when thunderstorms consistently developed in the same area and moved in a similar fashion across the state, continually dumping precipitation across the same counties. Known as training in meteorology, this phenomenon is also present in our MetStorm analysis of Texas/Oklahoma heavy rainfall from a couple of weeks ago. Much like this previous storm analysis, heavy rainfall at night caught many towns off guard, and combined with the swiftness of onset flooding, created disastrous consequences and has lead to a massive recovery effort. Our MetStorm analysis was run for the three and a half days that roughly correspond to the length of heavy precipitation. Below is the mass curve time series plot showing incremental and accumulated precipitation for the area of heaviest rainfall – located in Greenbrier County – in UTC time. For reference, UTC, or Greenwich Mean Time, is four hours ahead of Eastern Time during the summer, so midnight Eastern Time corresponds to 4 UTC. While there are times of marginal rainfall throughout the time series, by far the most amount of rain fell during the second half of the 23rd. Above we mentioned that this time period saw training thunderstorms repeatedly unleashing rainfall throughout West Virginia. At this site, the largest hourly value of rainfall was about 2 inches in one hour. And again for perspective, Lewisburg and surrounding areas receive on average ~3.74? of rainfall during the entire month of June. Focusing more on this 24-hour time period of heaviest rainfall, our next MetStorm analytic is of the total amount of rain that fell during this time over the entire area analyzed, which is plotted below. The maximum 24-hour precipitation across our analysis area is 8.48?, again focused near Lewisburg in Greeenbrier County. This area, unfortunately, contains some of the most mountainous terrain in West Virginia. Expanding on this analysis of 24-hour rainfall totals is a map of the MetStorm-generated Average Recurrence Intervals, or ARIs. ARI is the probability of the occurrence of the total recorded rainfall amount over a specified duration in any given year. Given all that we have discussed in this post, we already expect this storm event to be a rare event, but 24-hour ARI values for a large swath of West Virginia show an event that is exceptionally rare, with many areas experiencing rainfall that has a less than 1 in 1000 chance of occurring during any given year. Determining a disaster mitigation strategy is hard work when you’re dealing with an event that has such a small chance of occurring, especially when historic rainfall creates the type of flood-swept-burning-house scenario you’d expect to find in a movie.